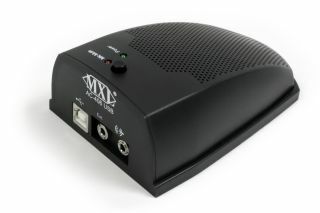 MXL Technology, a division of Marshall Electronics, will introduce the AC-406 USB Desktop Communicator at this year’s InfoComm '09, June 17th-19th in Orlando, FL (booth# 2978). Connecting easily to a PC or Mac USB port, the AC-406 lets telecommuters work head-set free and experience crystal-clear audio on web-based conference calls, panel discussions and more. With a sleek, portable and non-obtrusive design, the AC-406 USB Desktop Communicator provides a more personal web conferencing experience and is particularly helpful to telecommuters who rely on over the internet conferencing services like Skype and iChat. The AC-406 also performs exceptionally well with speech to text software programs like Dragon. Properties that give the AC-406 a district advantage over traditional desktop microphones include a three-capsule boundary design with 180-degree coverage and a 16-bit Delta Sigma A/D converter. The AC-406 also includes two 1/8-inch audio jacks, one for stereo headphones for private conversations and the other for daisy chaining multiple microphones for group discussions. A mute switch is also included with an LED indicator that indicates when the mic is muted.